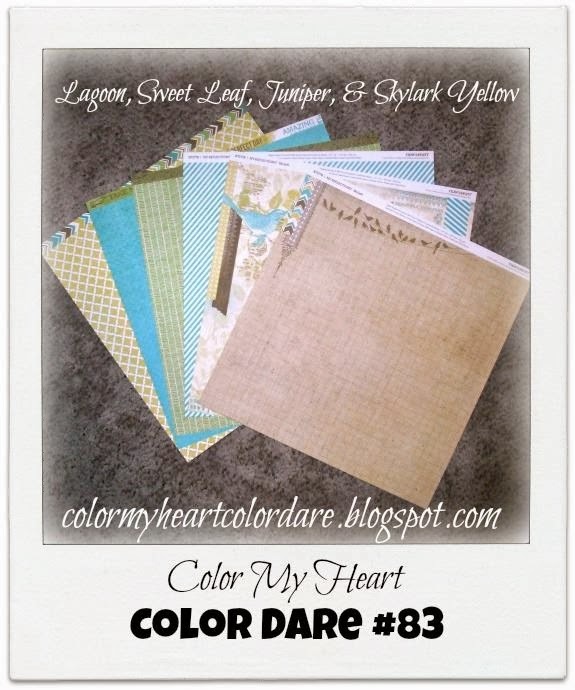 Color Dare #86 used the CTMH Exclusive colors Ponderosa Pine, New England Ivy, and Goldrush. 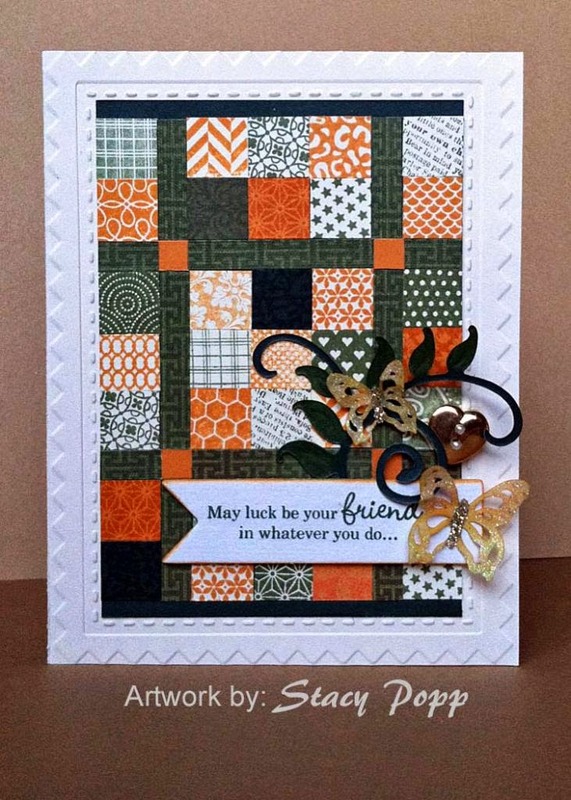 Congratulations to Diamond Winner Stacy for her wonderful patchwork card! Jody is our Emerald Winner this week. 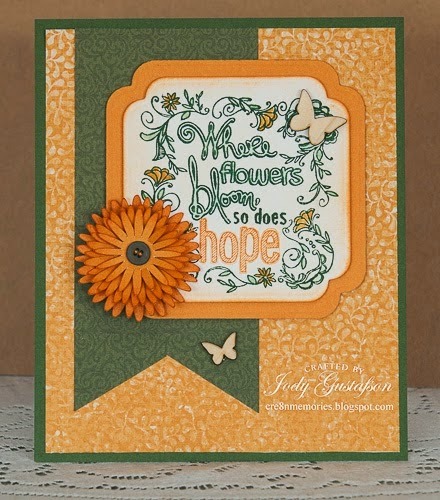 She created a nice Springtime card using the traditional Fall colors of this week's Color Dare. You can read details on her Cre8n' Memories blog. 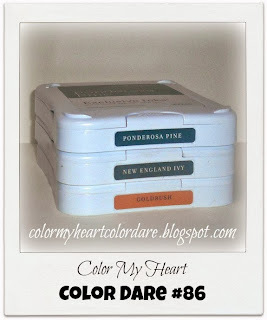 If you are a Color Dare winner, please visit the Blog Badges tab and share your winner's badge proudly on your blog! 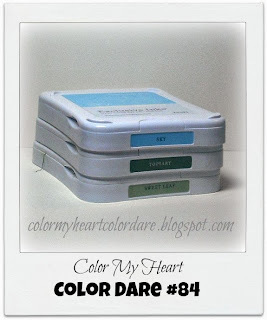 Be sure to join Color Dare #87 using Close To My Heart exclusive colors Blush, Hollyhock, Ivy Lane Green, and Ivy Lane Purple. Click on the image to visit the post and add a link to your project. Entries are accepted until 9:00 pm on Thursday evening (April 3). I have been busy this week getting ready for the birth of my baby (scheduled to come on Monday! ), and my parents are visiting from out of town, so my creativity is not too big right now. I just made the first WOTG layout from the Ivy Lane Workshop on the Go. You can read more about it on my blog. 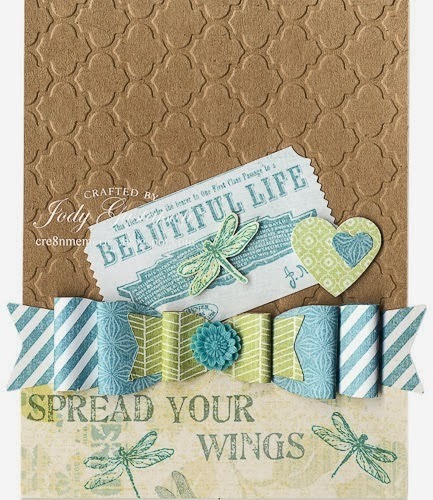 Our guest designer this week is one of our loyal participants, Jody Gustafson. 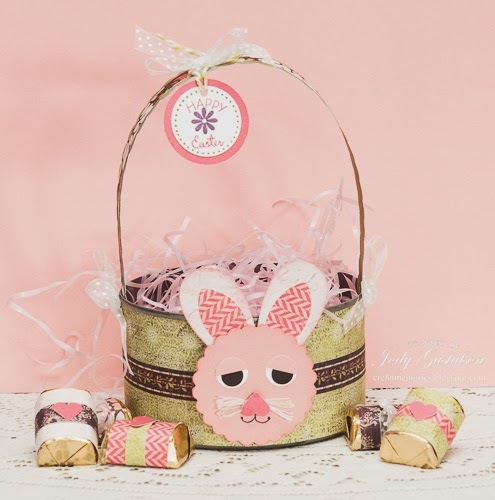 Look at this wonderful Easter basket project! Now it's your turn! Make a project using the featured colors. If you don't have the Ivy Lane paper pack, don't let that stop you! Just use Blush and Hollyhock with Sweet Leaf and Smokey Plum, or something similar. It should be close, but doesn't have to be exact. Take a photo of your project and upload it to your blog. 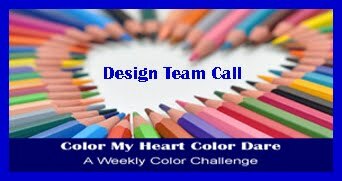 Include a link to us and our challenge photo in your blog post. Link your post (not your blog in general) up at the bottom of this page. Most importantly, don't forget to have fun! Please read the sidebar for complete challenge rules. Color Dare #85 used the CTMH Exclusive colors Autumn Terracotta, Barn Red, Olive, and Hollyhock. Congratulations to Diamond Winner Jody for her beautiful flower card which made me smile. Visit her Cre8n' Memories blog for details. For the second week in a row, Katrina is our Emerald Winner. 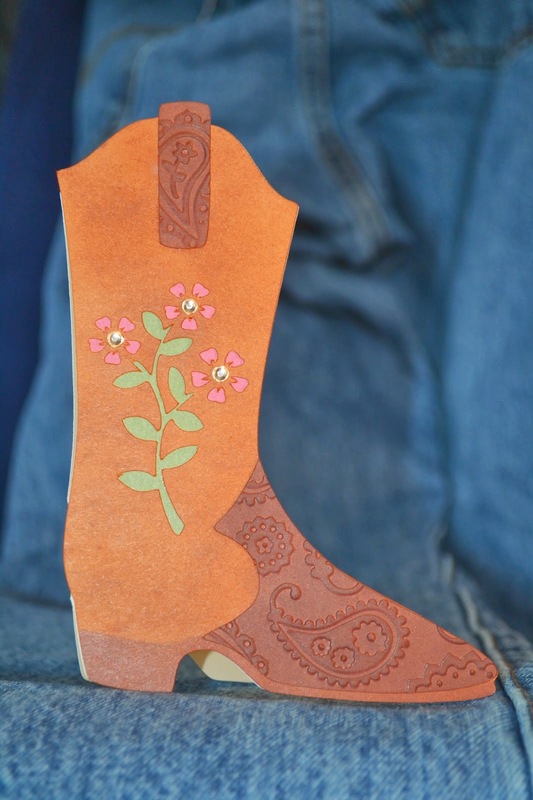 She created an adorable cowgirl inlaid boot card. You can read details on her ScrappyHorses blog. 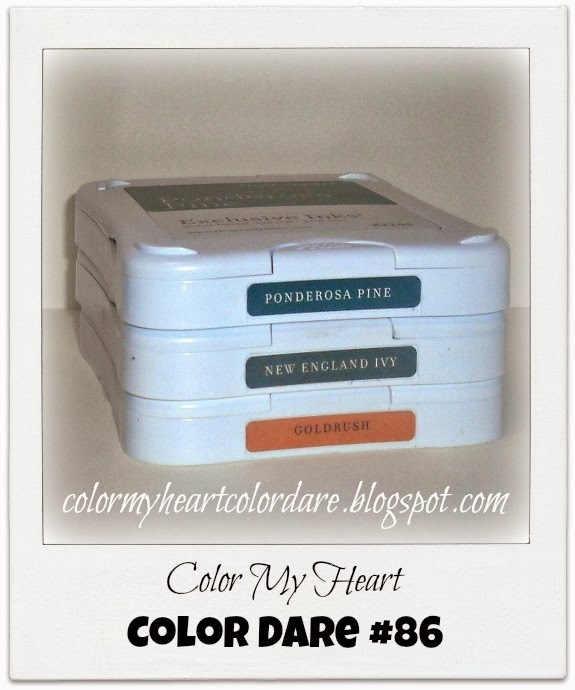 Be sure to join Color Dare #86 using Close To My Heart exclusive colors Ponderosa Pine, New England Ivy, and Goldrush. Click on the image to visit the post and add a link to your project. Entries are accepted until 9:00 pm on Thursday evening (March 27). I made a layout using some retired Flirty paper with the complements. You can read more about it on my blog. Our guest designer this week is Casandra Bennett! She made these adorable little camper cards. Aren't they cute? Color Dare #84 used the CTMH Exclusive colors Sky, Topiary, and Sweet Leaf. These colors are great for a nice, fresh look. 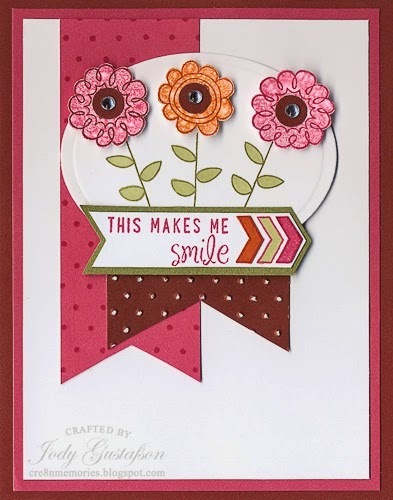 Congratulations to Diamond Winner Casandra who created this fun card which reminds me of springtime. Visit her ScrappinBliss blog for details. For our Emerald Winner, Katrina created a cute card with a whimsical Dr Seuss feel. You can read details on her ScrappyHorses blog. It's interesting to note that both winners used the new Topairy Chevron ribbon, and yet their projects have very different looks. 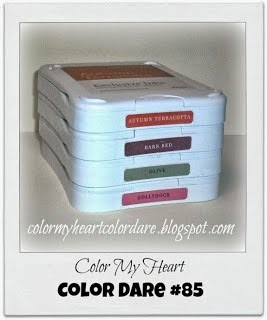 Be sure to join Color Dare #85 using Close To My Heart exclusive colors Autumn Terracotta, Barn Red, Olive, and Hollyhock. Click on the image to visit the post and add a link to your project. Entries are accepted until 9:00 pm on Thursday evening (March 20). 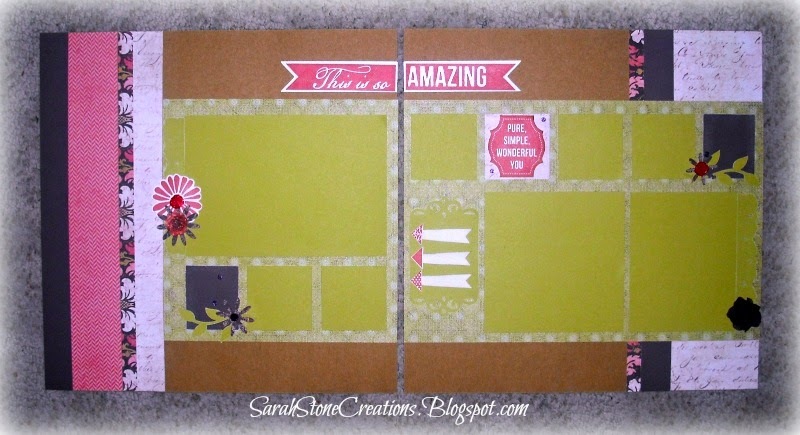 I made a layout using scraps from a very old paper pack called Boom-di-ada! You can read about it on my blog. 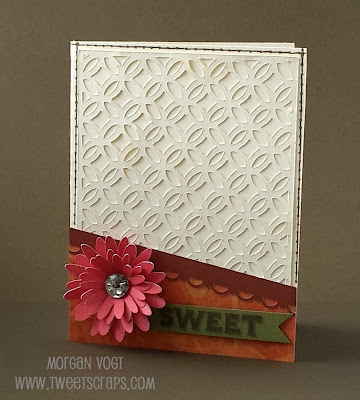 Morgan Vogt, our guest designer this week made a Sweet card! Didn't she nail this combo? Congratulations! You are our February Prize Winner! Please email me at stamplady@kc.rr.com with your mailing address so we can send you a prize! 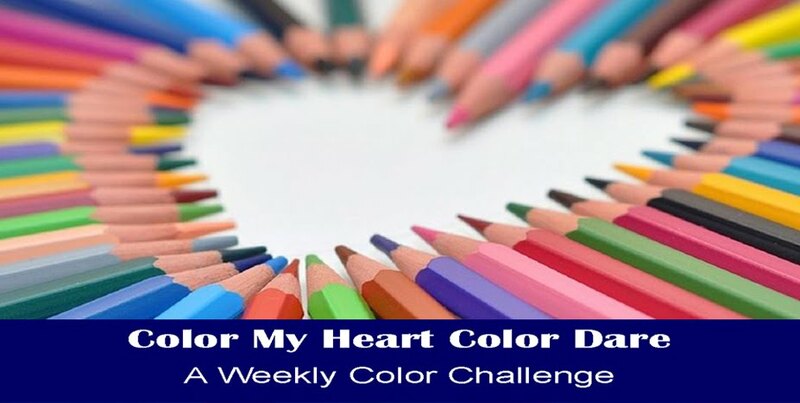 Thank you for joining us at Color My Heart. We hope you join us more in future dares. 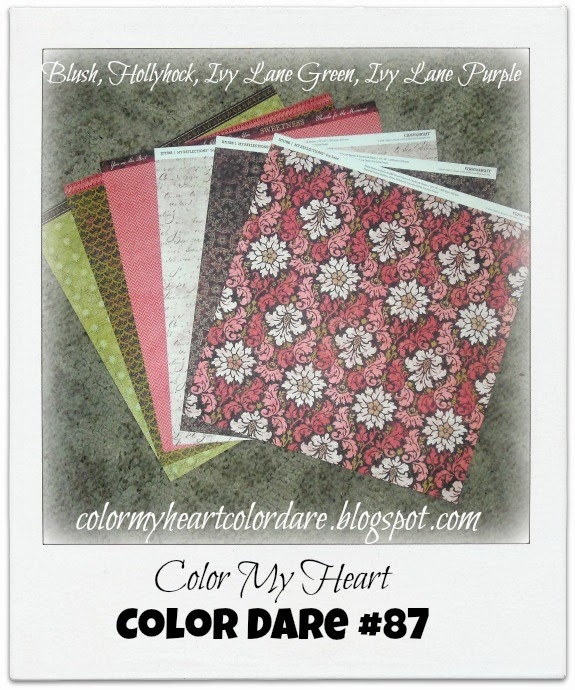 Color Dare #83 was to use the colors from Close To My Heart's Skylark paper packet. We had several participants for this Color Dare, with some very creative projects. 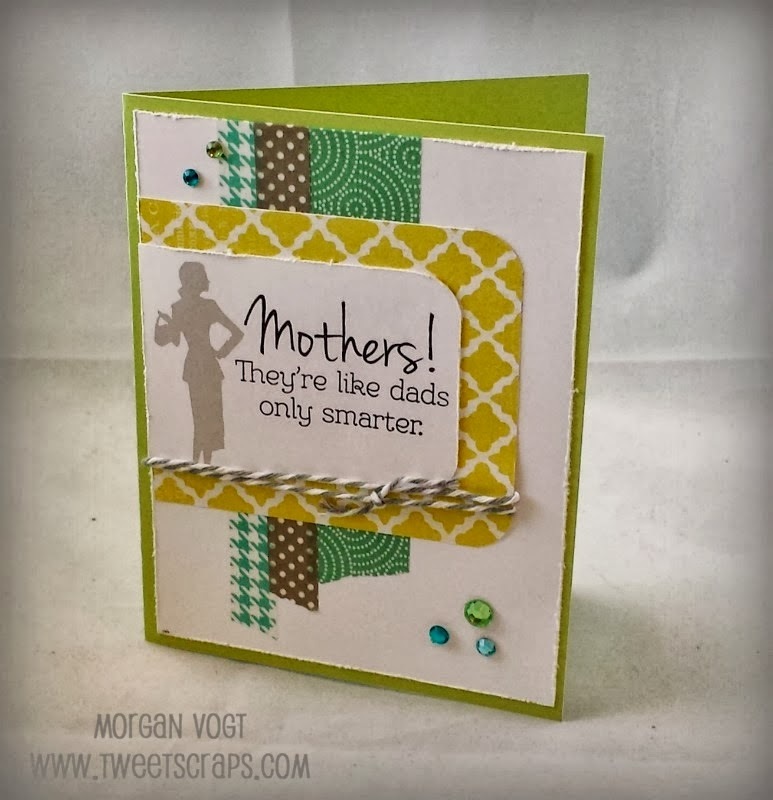 Congratulations to Morgan who shared a spunky card on her TweetSCRAPS blog and is our Diamond Winner this week. Great use of Washi Tape! 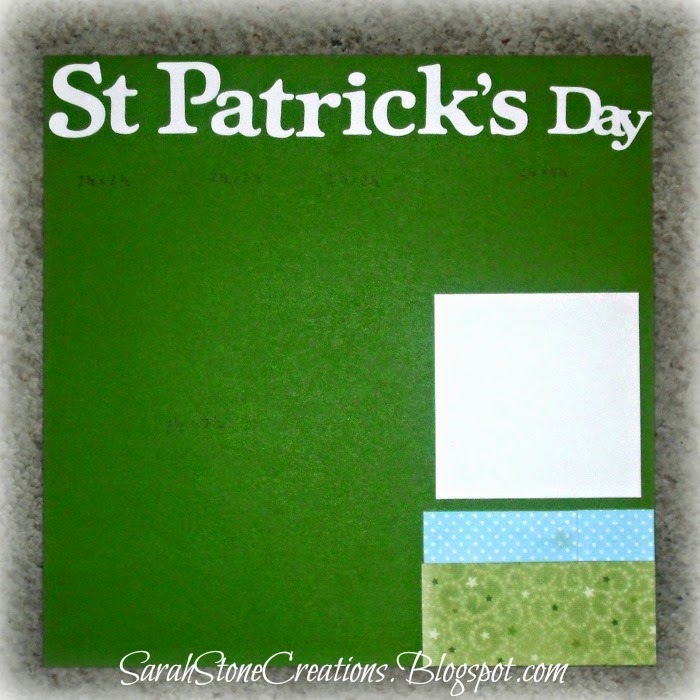 For our Emerald Winner, Jody created some pretty bows and used one of the CTMH embossing folders on her card. 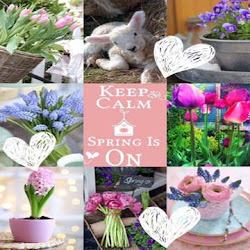 You can read details on her Cre8n' Memories blog. A unicorn is featured on our Ruby Winner. 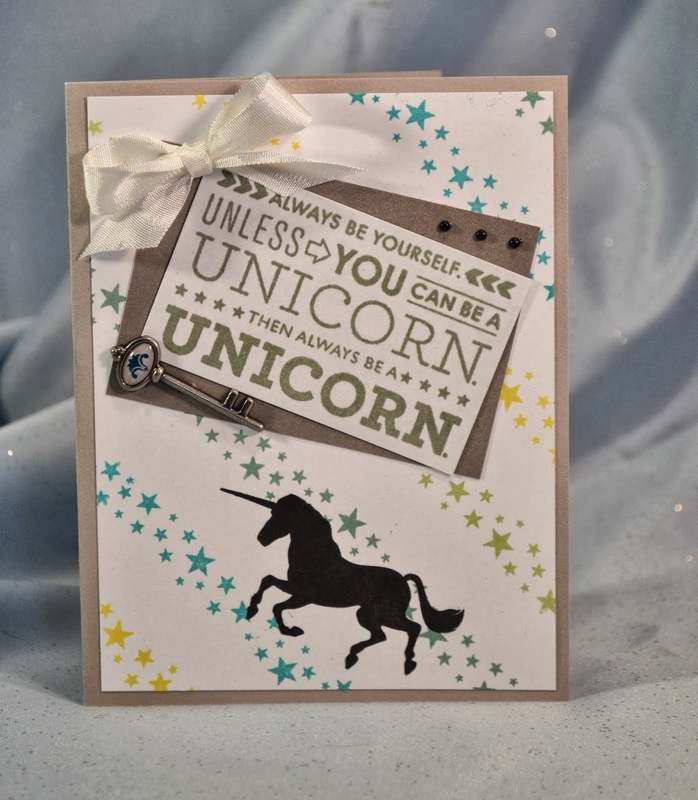 Visit Katrina's ScrappyHorses blog to see how she decorated the inside of the card. Be sure to join Color Dare #84 using CTMH exclusive colors Sky, Topiary and Sweet Leaf. Click on the image to visit the post and add a link to your project. Entries are accepted until 9:00 pm on Thursday evening (March 13). I made this layout using some scraps from my Believe paper samples. It will look better once I put the pictures on it. I have some cute ones from St. Patrick's day that need to be developed. You can read more about it on my blog. 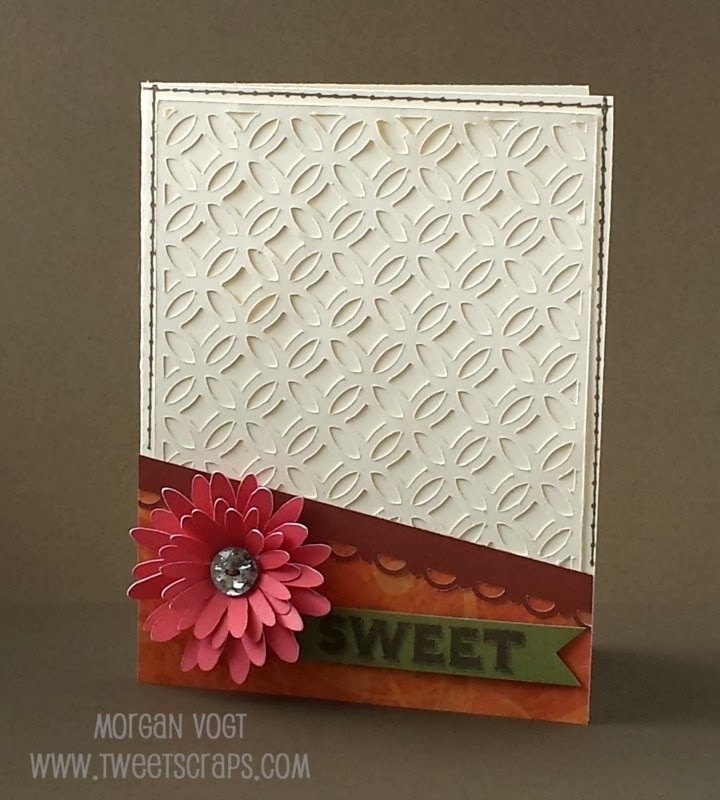 Our guest designer this week is Lauren Moore. 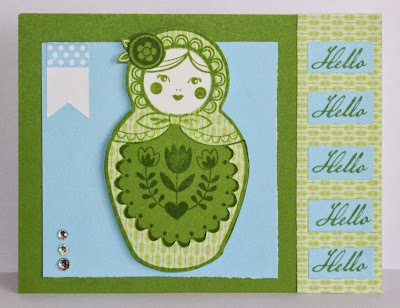 She made a beautiful card featuring this month's Stamp of the Month. I just love the Russian dolls!